Although I’m not someone who craves cheese, I was smitten with Field Roast Chao Slices at first nibble. This vegan cheese alternative held its own when eaten cold or melted, and had a satisfying umami quality. So I was excited to find out that Field Roast had used their Creamy Original and Tomato Cayenne flavors to make two varieties of Mac ‘n Chao! 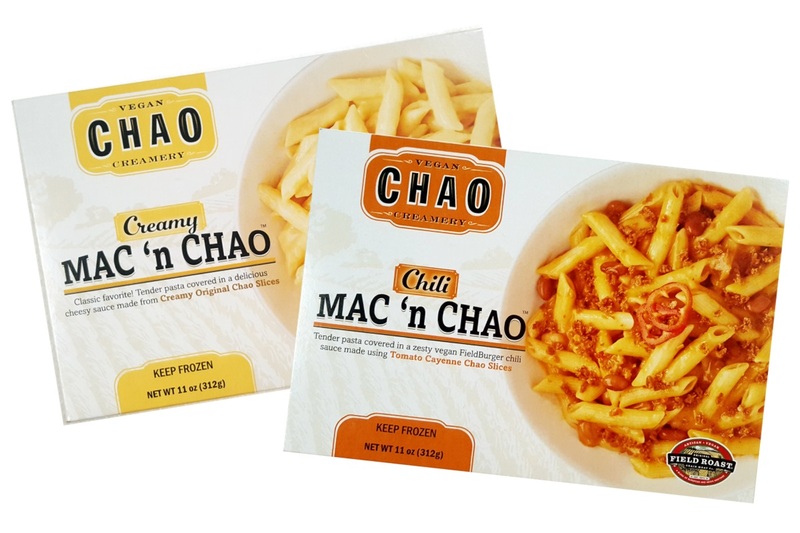 Mac ‘n Chao is a frozen vegan mac & cheese alternative. It’s a heat and serve meal with directions for both the microwave and the oven. Each 11-ounce box is a very light serving for two people, or a hefty pasta serving for one. 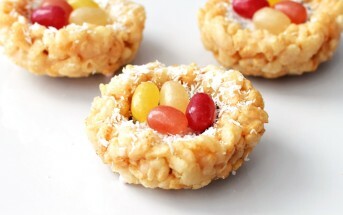 The have about 440 calories, 14 grams of fat, 10 to 16 grams of protein, 2 to 4 grams of fiber, and 0 grams of sugar per full box. We trialed the following two varieties. The flavor is quite nice. It’s very much like the Chao Creamy Original slices with a tiny kick of hot sauce for a hint of spice in the after taste. But I do think this freezer format is tricky. I tried different cooking methods, but each time, the cheesy sauce became a little thick, greasy and clumpy, with a bit of separation. After some stirring, it was more visually appealing and the sauce was tasty, but the noodles still cooked in a rather spotty fashion. Some dried out, some broke and were mushy, and some turned out perfectly tender. I’d love to see Field Roast turn this into a shelf-stable mac and cheese with dried noodles that you cook, and a prepared sauce that you squeeze on. I think this would resolve the cooking issues. Pasta is just a tough one to master from frozen! 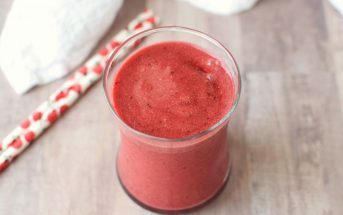 Ingredients – Enriched flour (durum flour, wheat flour, niacin, iron, thiamine mononitrate, riboflavin, folic acid), filtered water, Creamy Original Chao Slices [coconut oil, modified potato starch, fermented chao tofu (soybeans, sesame oil, calcium sulfate), sea salt, natural flavor, olive extract, beta carotene], nutritional yeast, modified corn starch, hot sauce (distilled vinegar, red pepper, salt) and spices. We really enjoyed the flavor of this one, too. The gooey sauce is a melted combination of the Creamy Original and Tomato Cayenne Chao Slices. And it’s spiked with a small smattering of pinto beans and bits of Field Roast’s signature vegan burger. Like the Creamy version, the noodles refused to play nicely, resulting in some very dry and very mushy spots. And I would have loved a double helping of FieldBurger and pinto beans to “beef” this up to two servings. Nonetheless, the warm, tomato-y, spicy, cheesy sauce tasted quite delicious. Ingredients – Creamy Original and Tomato Cayenne Chao Slices [coconut oil, modified potato starch, fermented chao tofu (soybeans, sesame oil, calcium sulfate), sea salt, natural flavor, olive extract, beta carotene, tomato juice, green and red dried bell peppers, cayenne pepper and paprika extract], filtered water, enriched flour (durum flour, wheat flour, niacin, iron, thiamine mononitrate, riboflavin, folic acid), FieldBurger (vital wheat gluten, organic expeller pressed palm fruit oil, barley, garlic, expeller pressed safflower oil, onions, tomato paste, celery, carrots, naturally flavored yeast extract, onion powder, barley malt, sea salt, celery seed, black pepper), pinto beans (pinto beans, salt), modified corn starch, hot sauce (distilled vinegar, red pepper, salt) and spices. Price: At last check, Mac ‘n Chao was around $5.99 per 11-ounce frozen meal. 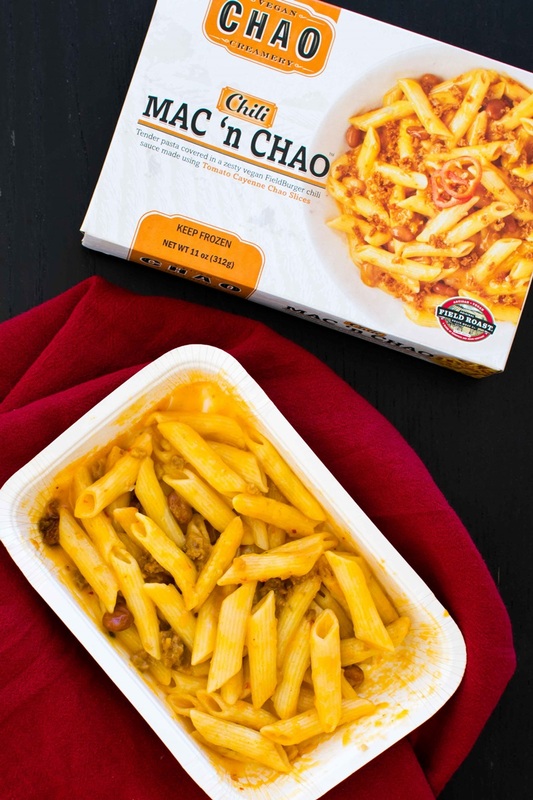 Availability: Mac ‘n Chao is available in the freezer section of stores in the United States (and possibly Canada), but we aren’t sure on specific stores. See where to buy on their website. Certifications: Mac ‘n Chao is Certified Vegan. 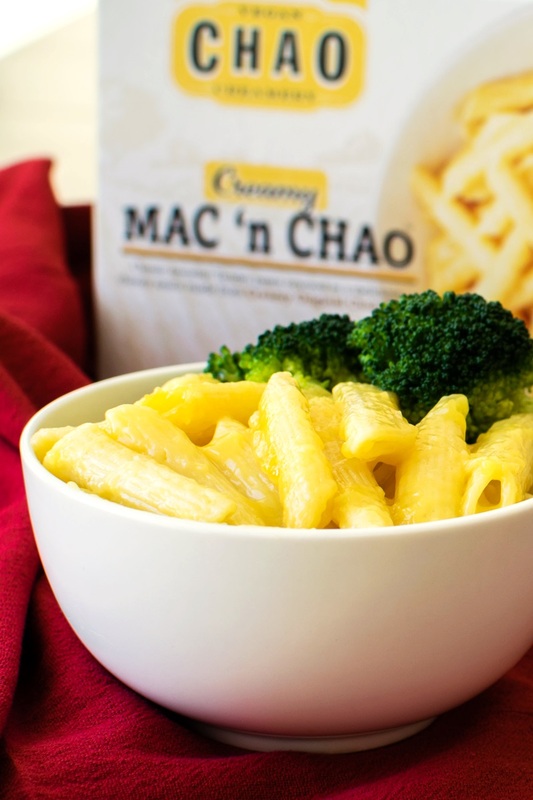 Dietary Notes: By ingredients, Mac ‘n Chao is dairy-free / non-dairy, egg-free, nut-free, peanut-free, vegan, and vegetarian. They also state that they run a vegan production facility. Nonetheless, check with the company on their manufacturing processes for all varieties if potential allergen cross-contamination is an issue for you. Processes and labeling are subject to change at any time for any company / product. For More Product Information: Visit the Field Roast website at fieldroast.com. I just tried the chili mac and I was pretty disappointed. There were like ten beans and exactly one piece of Field Roast in the one I purchased. And I had the same issue with the noodles – some super mushy and some so brittle I couldn’t eat them. Shucks, I love the slices but I probably won’t purchase the mac & chao again. This is our favorite dairy-free cheese, so I feel like there’s potential here. I hope they work out the kinks.